Kimberly Proces Chairmanship to India. Kimberly Process Chairmanship to India recently received in December’s 2018. It is a certification scheme in diamond. 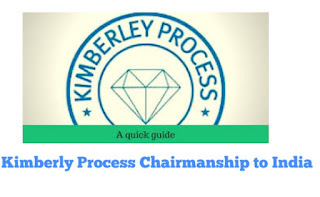 Kimberly process is a certification scheme. India will chair the Kimberly process which established in 2003 by a United Nations resolution to remove conflict diamonds from the global supply chain. We know in UN general assembly where voting is taken in general assembly. All Countries vote right is same. In UN general assembly through the voting Countries can make institution or certification scheme. Similarly, Kimberly process certification was created in 2003. Since, August 2013 Kimberly process has 54 participants are representing 81 Countries. Blood diamonds or conflict diamonds are the rough diamonds which is used by rebel movement in the third world countries especially in Africa to finance civil wars with an aim to topple legitimate governments. There is a famous movie on this topic of Leonardo caprico is ‘Blood Diamond‘. Conflict diamond may be any diamond from which a illegal work is being done. Suppose, one country in Africa where mining is being done and that region is influenced by terrorist group or dictator who forcefully doing mining by labour and the unrefined diamond they produce. If that diamond is sold through broker then that diamond is called conflict diamond or blood diamond. The KPSC completely bans imports and export of rough diamond without certification. This certificate gets to those who import or export diamonds specially from Africa. It comes under commerce and industries ministry in India. 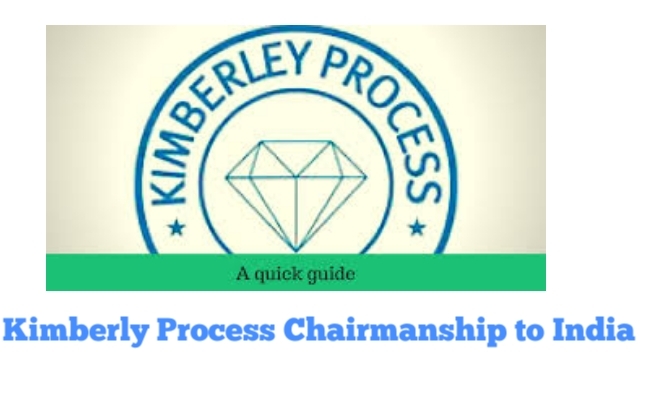 So we hope you are aware about Kimberly process chairmanship to India.